Nearly time for me to dive head first into Christmas card making mode. 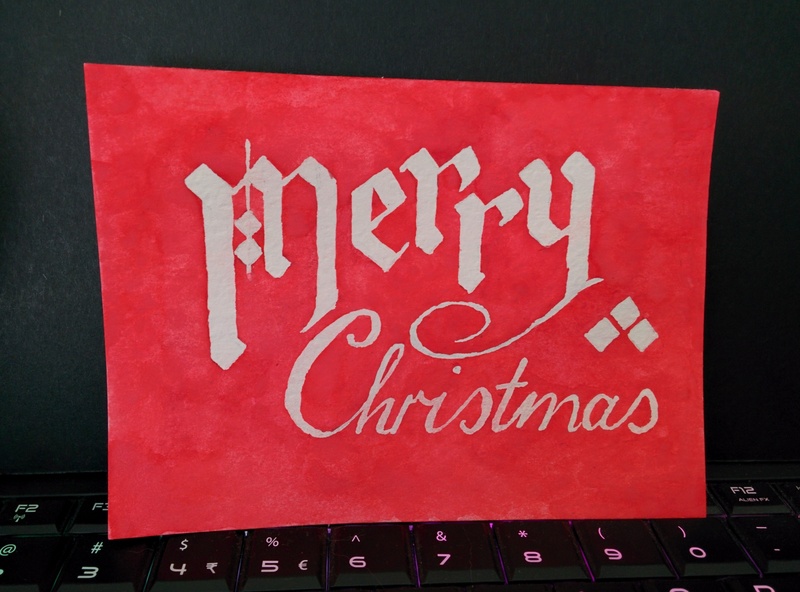 There’s some lovely inspiration this year, and I think I’m leaning towards more watercoloured cards, so that I can make them more personalised. Sometimes I stalk the peoples Facebook pages for ideas on what they like, for inspiration and a personal touch, but now that sounds creepy. 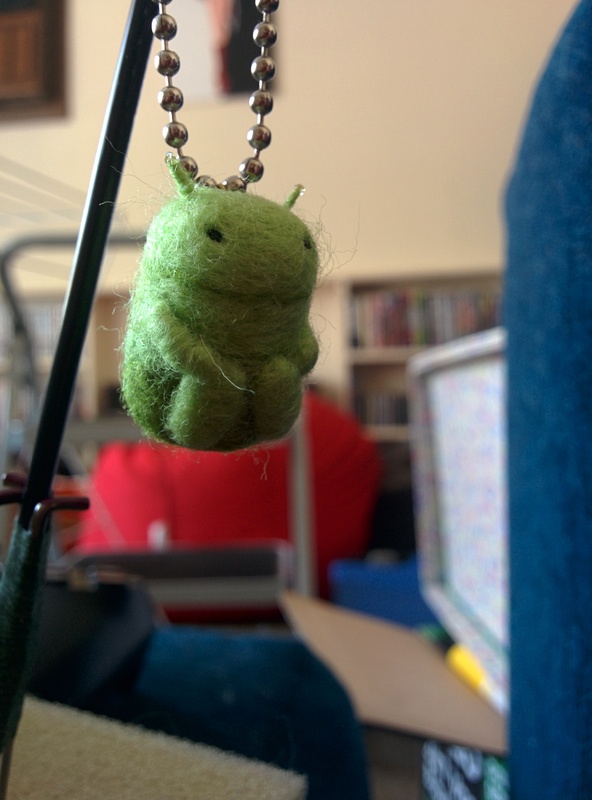 As for felting, if you don’t know, the little green guy in the picture is the mascot for Android- the rival to Apple iPhones. We are strong Android fans in this house, and my partner loves it. He even has a group on Facebook where all his friends talk about updates and technical things. This is why when I saw the green wool that I received in my package, that matched the mascot, I knew I had to make him a mini Android. 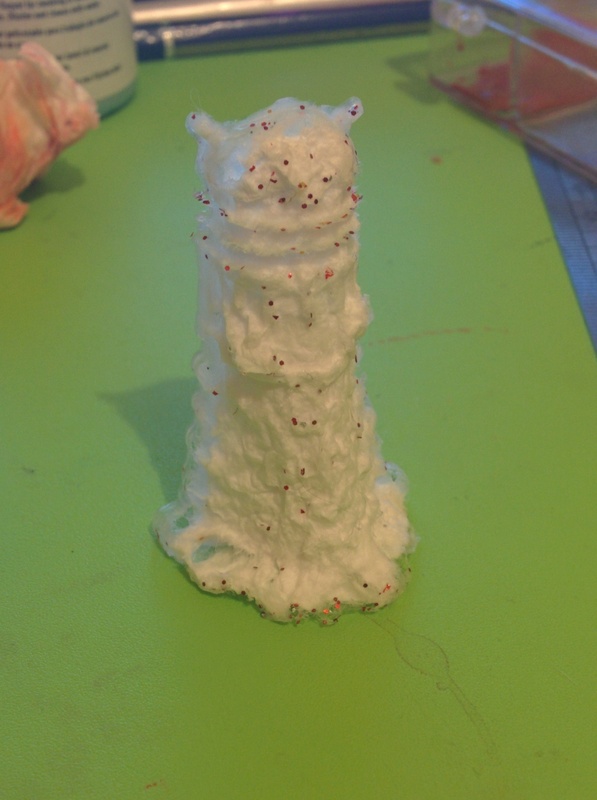 I began with a polyester filling core, so I didn’t use too much of the colour. I think felting is a lot about will power. If you will something to be a certain shape, then go into auto mode while you stab, you end up with that shape. Or something like that. Once I had the base shape, which was a cylinder with one domed end, covered in a gradient from lime green to apple green, then added tiny dots for eyes, and a dark line to separate the body pieced, I had to figure out what to do with the limbs. In the logo, Android’s arms are floating next to his body, and his legs are tiny sticks poking out from below his body. I wanted to make him look a little cuter, and have large feet. This worked out great for the design, as it’s much more efficient having tucked in limbs than bits sticking out, vulnerable to damage. I made the arms by wrapping wool around the felting needle, then pulling it off, holding the wool firmly, and stabbing carefully at each end until it was a stable shape. I added it to the body before it was too firm to be manipulated. The antenna are pieces of wire, glued into the head with glossy accents by ranger (any strong glue will do.) I then wrapped the wire until it was covered with wool, and added a dot of glossy accents to the end of the wires so they weren’t as sharp and dangerous. Lastly, I folded a piece of wire around the keyring chain, and twisted it into a tight eyepin shape, and glued it into the figures head. It’s cute working in such a small scale, but tricky and more likely to stab yourself. My next project has to be a bit larger to give my fingers a rest. It’s awfully addictive though, I’m trying to stab wool between scenes in the game I’m playing in an attempt to multitask. It’s like shopping without money, or presents from my past self. Today I received some merino wool that I got off ebay. 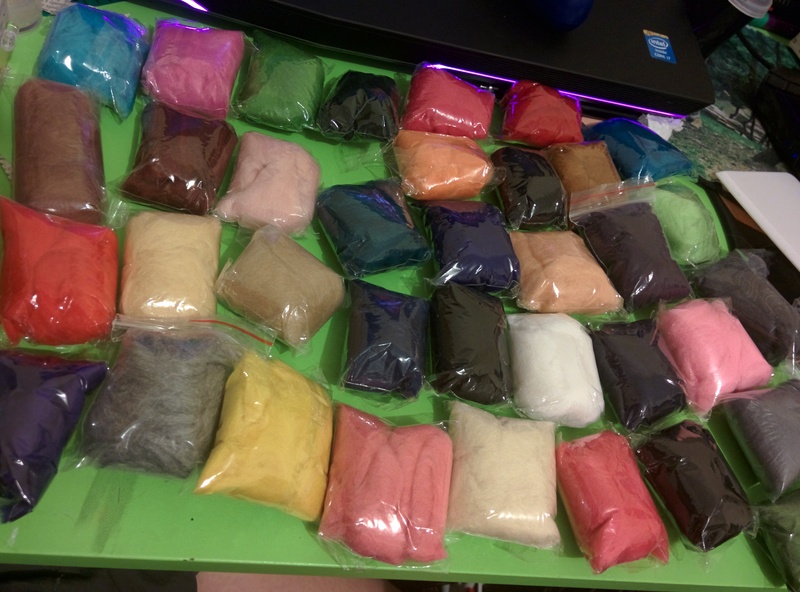 Each packet is about 3 grams, so maybe 2cm by 3cm bags, and there’s 36 colours. 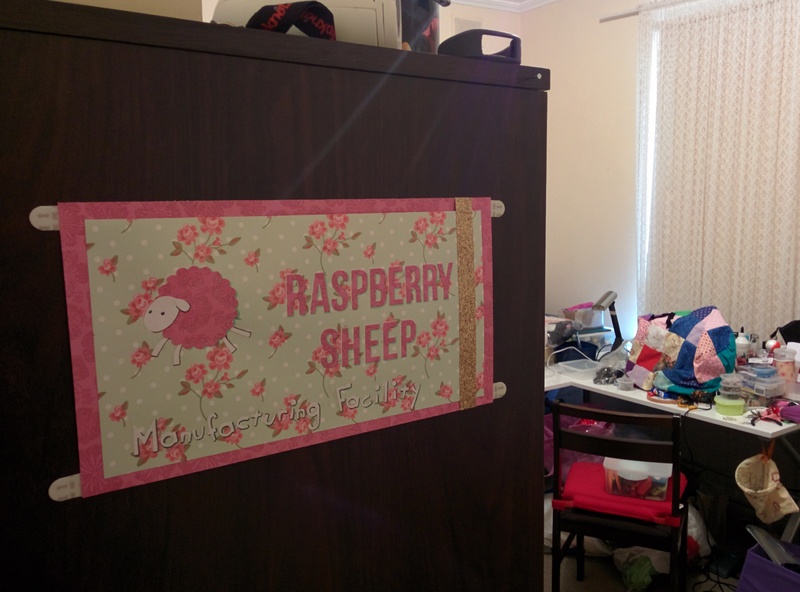 I got a small amount of a lot of colours, as I like making small projects, I can use filling as the core, meaning I need less wool, and I wanted to see what colours I’d use. There are so many beautiful colours though, I think I’ll use them all. 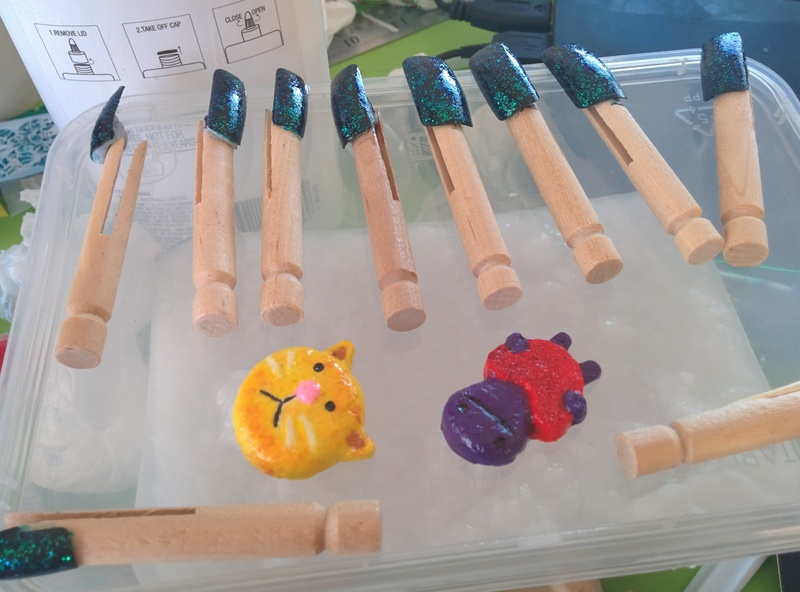 The first thing that I want to make is little figures of my own cats. I haven’t decided whether to make them realistic, or cartoonish. 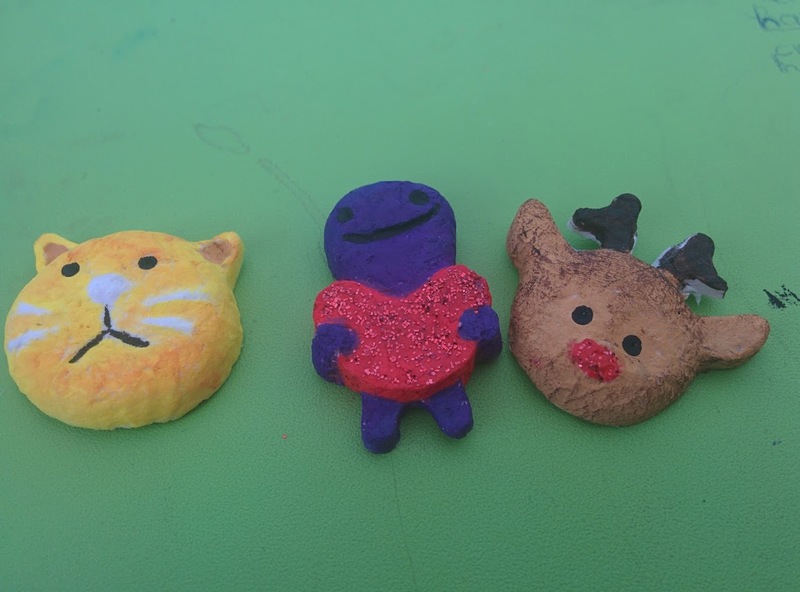 I wonder if I could make them small enough to be on a necklace. Luckily wool is lightweight. I’ve been looking to Pinterest for inspiration, and there are so many great creations to get inspiration from. I’ll have to create a few different things. 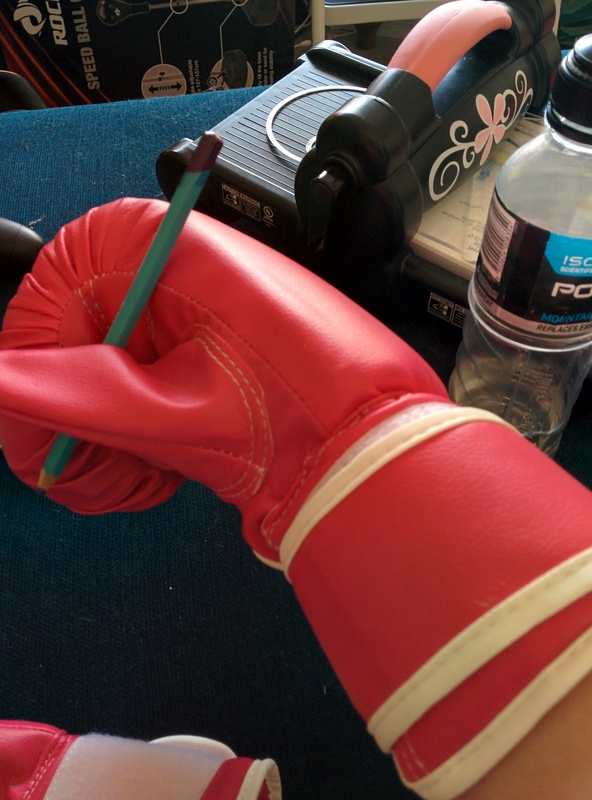 Better get my guard gloves on. Just a quick update today. I’ve been busy working on a secret project. But while I had the paints out, I’ve nearly completed my pirate chest. 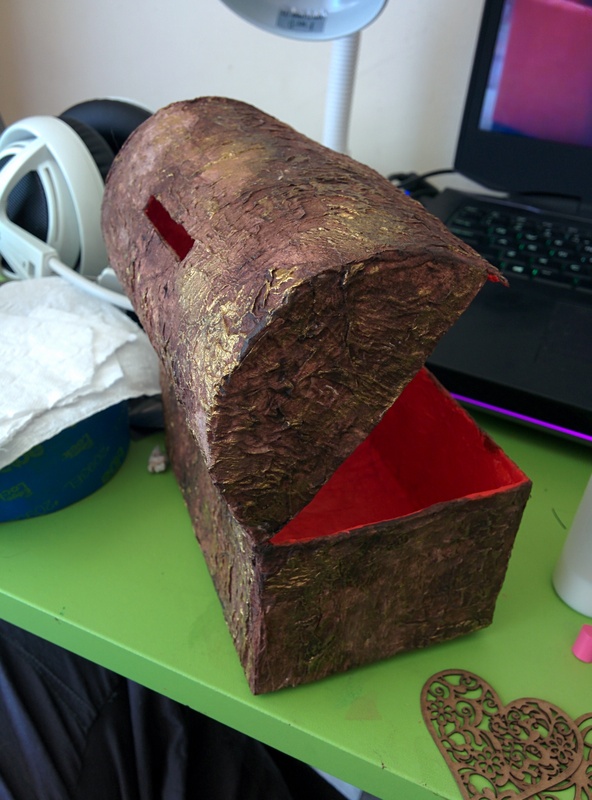 I covered it with texture and turned it into a money box. All I need to do is figure out a closing, and it’ll be ready for all my gold coins. I was thinking of supergluing a metal clasp from another box onto it, or maybe Velcro or a snap popper. 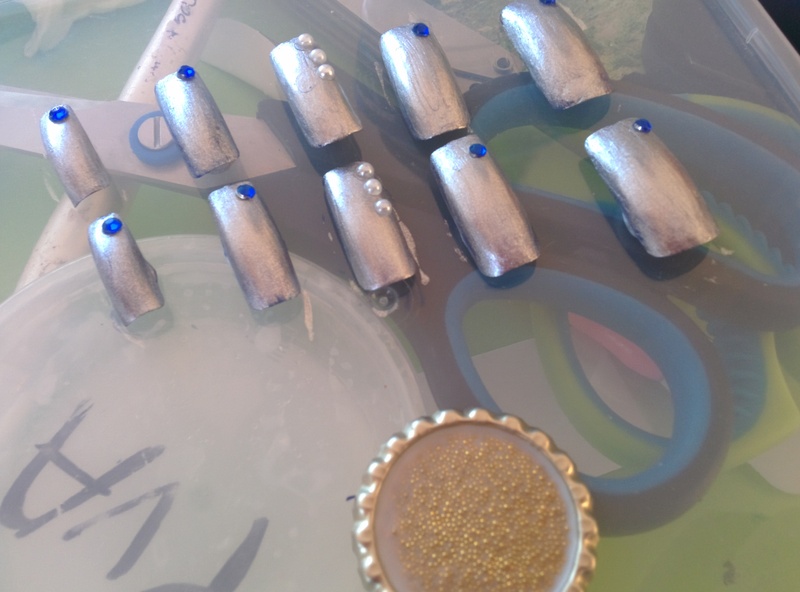 I think I’ll try the clasp first, as it’ll look the best. Maybe I could try a bracelet clasp with chains. I’ll see what I have. It’s a small project, just for myself, so I’m not going to go and buy anything specifically for it. Maybe if I make more, for other people. I’m not the biggest fan of mosaic with too much effort or crazy patchwork as it looks weird. 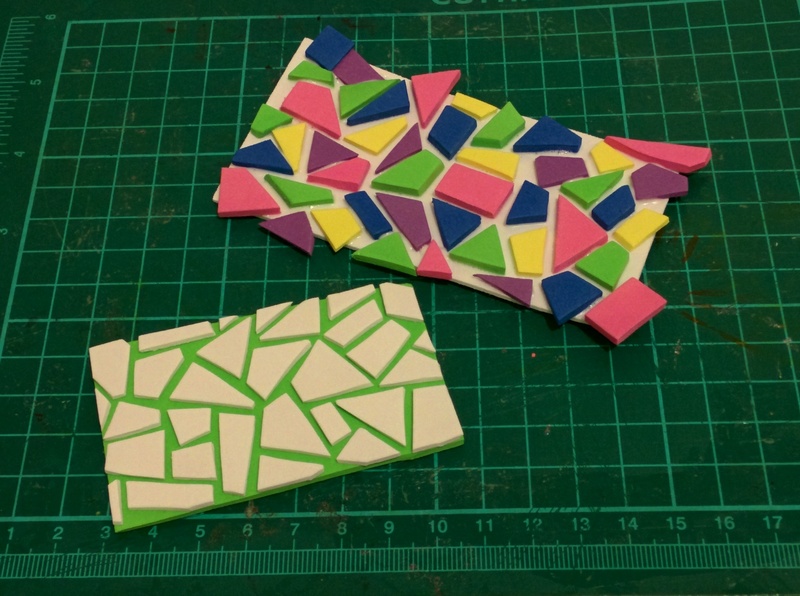 But making mosaic out of fun foam is like a lazy puzzle. 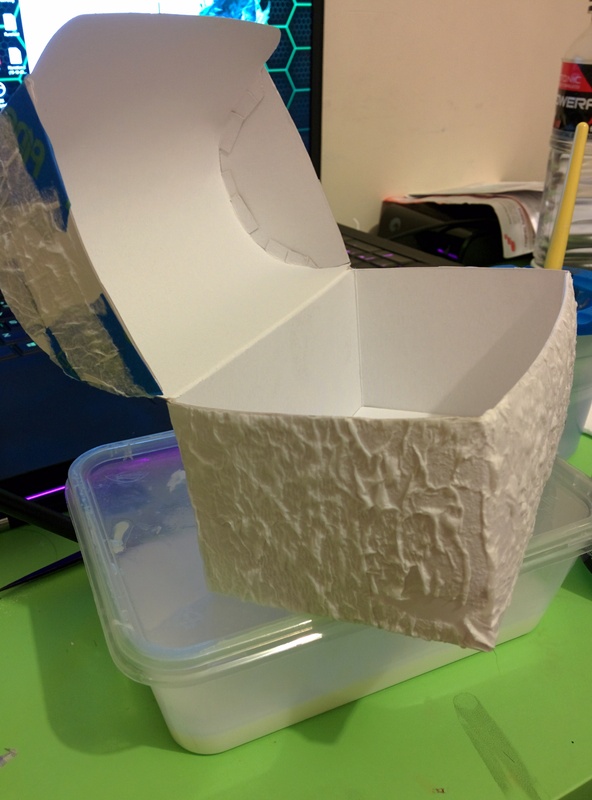 Using adhesive backed foam, or glue, I cut up foam in little bits, and stuck them on, simple is that. Not much more to say about it. Not sure what to use it for. Perhaps on cards… Or itty bitty garden path made of astroturf. I figured it out! Logically and not by fluke at all. My android phone had updated to Marshmallow 6.0 recently which is when all the problems started. My partner was happy because this meant he could adjust permissions to be a lot more strict, using a new feature allowing the user to choose which apps had which permissions, instead of always having all access and no choices. I put all this information into my head and yesterday figured that it was a permissions problem. My partner showed me where to find the options for this in the settings, not in the app as I had thought. As I suspected, the app had not been given permission to access my device files or camera. This is an awesome security feature, but I would have liked more information that the permissions had been turned off. So if you have the WordPress app on android, and keep getting the warning, media item could not be retrieved, try looking at your permissions. I’m sorry for such a technical post, but I couldn’t find the answer online, so hopefully this helps out others. This also means back to regular posting. Yay!